There were some short-lived dips to below the €5,500 level such as on 29th June when it got down to €5,083 but €5,500 remained the ball-park exchange rate, with rally peaks all but gone by September 2018. Compared to the actual early-2017 peak-to-trough fall of €8,700 the levelling off at €500 above my expectation implies an error of 5%, so on the whole I feel my prediction was quite accurate. 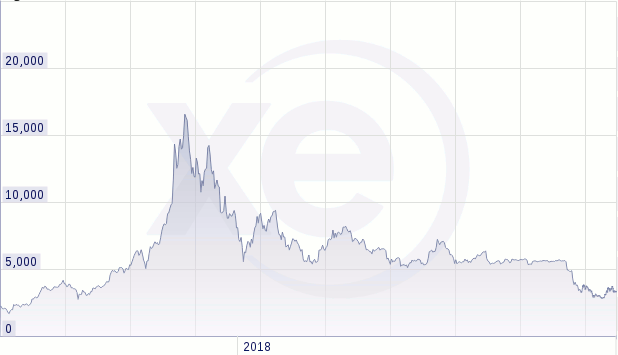 However on 14–15 November Bitcoin finally went over the cliff-edge, bottoming-out at €2,773 mid-December, and since then has had a ceiling around the €3,500 mark — a date that coincides with Nvidia reporting a glut in the type of graphics cards that are typically used by Bitcoin miners. I have no doubt that actual investment by miners dried up months before, but it looks like the miners are now exiting completely as the return-on-investment of keeping the kit running has been decimated, and I suspect most are liquidating their holdings as well — according to Bloomberg back in April around 20-30% of Bitcoins were held by Bitcoin miners, and if I was in their position I would be looking to exit completely. The mass exit of Bitcoin miners does not bode well for Bitcoin's underlying scalability and cost problems, which has already seen Bitcoin go from an actually useful currency with a half-decent velocity to an increasingly illiquid asset. Valve's Steam service stopped accepting Bitcoins last year, Expedia stopped in July, and even Bitcoin conferences won't touch them any more. Bitcoin is in a death spiral because the small-time and casual users are all being squeezed out, and this is crashing its mind-share in relation to other forms of cash.